3. What is innovative legal advice? What constitutes legal advice is changing. Specialist domain expertise will always be required but increasingly the way in which it is required is changing. Business problems rarely need one solution. Even what would appear to be one-track legal problems require knowledge of other practice areas and expertise. Specialist legal expertise that is connected to other legal domain specialists. Commercial context and understanding that connects and frames the legal advice into the bigger client and industry picture. Strategic, long-term view that can “find” or anticipate problems. An approach that looks beyond the immediate problem. Delivery model: Cost arrangements, technologies and effective people resourcing are necessary components of a successful transaction or litigation. Often, the client appreciates effective delivery over the brilliant piece of legal advice. Increasingly, the way in which advice is delivered, whether using numerical or graphical approaches or different media channels and platforms is critical. 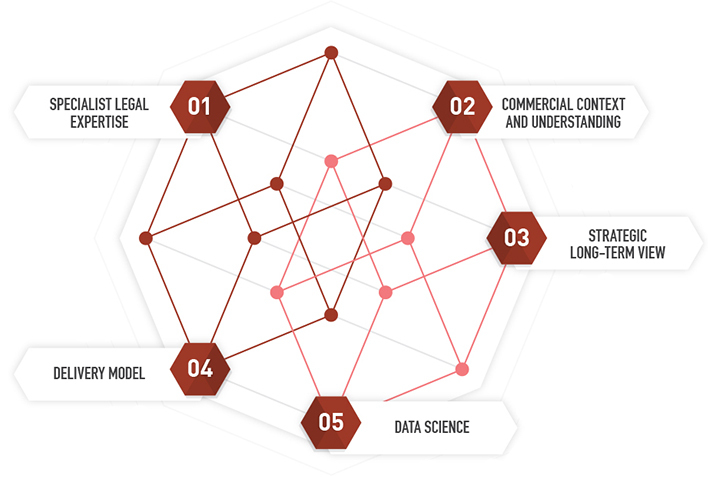 Data science: the ability of law firms to collate and analyse large legal data sets and offer predictive analytics of past outcomes and future trends is changing the content of legal advice. As many technology writers point out, the specialist combined with a smart algorithm will always beat out the experienced human working alone.